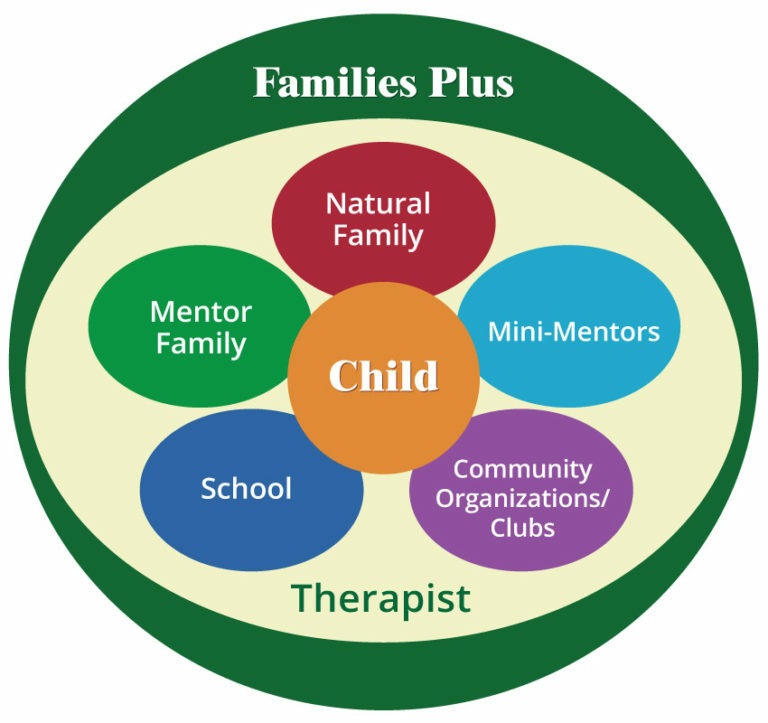 What is the Families Plus 'wraparound' approach? There are many different organizations in the Delta County community to support children who are struggling, from school programs to human services. Despite these well-organized efforts, most children who are vulnerable and undeserved get no coordinated ongoing services at all until their situations are critical. Families Plus wraps services around each child. The parents indicate what their child’s needs and help their team to find ways to get and keep what is needed as long as needed. The Families Plus Wraparound Health Care Model organizes the community and the health care system to step in early and stay involved with a complete package of support that hold promise to bring these children through into healthy self-sufficient adults. The licensed psychologist, or professional counselor that is assigned to each child guides health care services and coordinates an entire team of volunteers. The Families Plus electronic health record on each child documents all his or her care. This organized support goes on year after year with less and less professional coordination until the child emancipates. We strive to ensure no health needs go unmet. In our innovative mental health care program, a mental health professional designs a plan for each child to improve a problem behavior. The therapist then works with the natural parents and child, mentors, teachers, and other supporters to work through the problem. Therapists also help mentors and other volunteers cope with the stress of some family situations. The strength of our model and its impact are illustrated by dramatic measurable changes in the well-being of children as they progress through the program. It truly takes a village to raise a healthy child. A sense of community is developed around each Families Plus child and family. The lives of our families are often chaotic and we strive to provide a sense of security. Our staff screens and trains volunteers to help parents provide a highly enriched world for their child. While living at home with the benefits of being with their own family, Families Plus children also spend time with their mentoring family to experience stability, structure, warmth, and supportive expectations for their behavior and success. Volunteer “mini-mentors” contribute skill-building activities, such as painting or athletic pursuits. Because parents in difficult circumstances and without resources often do not have a stable friend who is there when they need someone, both the mentoring family and the mini-mentor provide that needed support. ​We provide a variety of other services to children and families to improve their quality of life and chances at success. We have part time staff called “parent partners” that work to help families find resources and ensure their child needs are met. help to find transportation to doctors’ appointments, sports practices, etc. Families Plus works with a variety of families in Delta County. We welcome all styles of families and lifestyles from intact families, blended families, single parent and grandparent led families. We focus on Families that have high needs children but have low resources to ensure the child needs are met. We currently are working with over ninety children in Delta County and are still growing. If you think you have a child or know of a child or family that you believe could use our resources don’t hesitate to call.